WAIST HIGH: The Four Surviving Original MTV VJ's Record A Special For MTV's 30th Anniversary. The Four Surviving Original MTV VJ's Record A Special For MTV's 30th Anniversary. 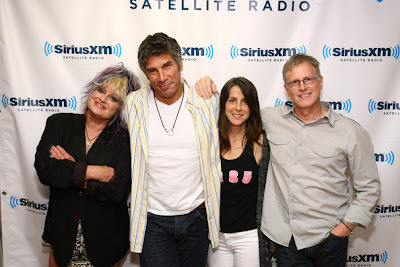 Nina Blackwood, Mark Goodman, Martha Quinn, and Alan Hunter came together on June 29 at the Sirius XM studios in New York to record a special for the 30th anniversary of MTV for SiriusXM's '80s on 8 channel. Original MTV VJ J.J. Jackson, "Triple J," died in 2004 at the age of 62. Not much has been released about the special but Alan Hunter has said that information is coming soon. MTV was launched Aug. 1, 1981 at 12:01 a.m with the words, "Ladies and gentlemen, rock and roll," spoken by MTV co-creator John Lack, and played over footage of the launch of Apollo 11. Those words were followed by the original MTV theme song playing over pictures of the moon landing and the introduction of the MTV flag. Of The Original MTV VJs, Steve Spears of tampabay.com had this to say, "I hope these four understand and are honored by the legacy they gave us."